GolfBC, Western Canada's largest golf course owner & operator, announces the launch of its iPhone mobile application to allow golfers to book real-time tee times 24/7 through their iPhone or iPad at all of GolfBC’s 12 courses throughout BC and Maui. The GolfBC app can be downloaded for FREE from the iPhone App Store. In addition to tee times, the app features golf course contact information, interactive map and directions to the course, live course Twitter feeds, live GolfBC Facebook feed, daily weather forecast and more. For more information on the GolfBC iPhone app, visit www.golfbc.com/about_golfbc/mobile. “GolfBC has been offering real-time bookings on our website since 2002, and we are very excited to now provide an even more convenient way for golfers to book their next tee time” says Rita Rennie, Marketing Manager at GolfBC. “With the free GolfBC app, golfers have a variety of tools at their fingertips, from tee times to directions to weather, and more”, she added. Vancouver-based GolfBC is a golf and resort management and investment company committed to defining a higher standard of quality and consistency among premier golf destinations. Since 1989 GolfBC has been creating premium golf destinations and master planned golf communities in British Columbia. GolfBC is the owner/operator of eight championship golf courses in British Columbia, including Nicklaus North (Whistler), Furry Creek (near Lions Bay), Gallagher’s Canyon (Kelowna), Olympic View (Victoria), The Quail and The Bear (The Okanagan Golf Club in Kelowna), Mayfair Lakes (Richmond), Arbutus Ridge (Cobble Hill),a 9-hole facility, The Pinnacle (at Gallagher's Canyon), and the Gold, Emerald and Old Blue courses at Wailea Golf Club on Maui, Hawaii. 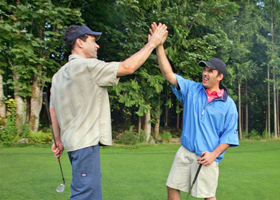 For information on GolfBC, visit www.golfbc.com.